In postwar Hong Kong, Ip Man is reluctantly called into action once more, when what begins as simple challenges from rival kung fu schools, leads to him becoming face to face with the dangerous underworld of the Triads. To defend himself and those he cares about, Ip Man must stand and fight one last time.Special Features Making Of, Cast & Crew Interviews, Trailer..
Having defeated the best fighters of the Imperial Japanese army in occupied Foshan, IP Man and his family settle in post-war Hong Kong. Struggling to make a living, Master IP opens a kung fu school to bring his celebrated art of Wing Chun to the troubled youth of Hong Kong. His growing reputation soon brings challenges from powerful enemies, including pre-eminent Hung Quan master, Hung Chun-nam (Sammo Hung). 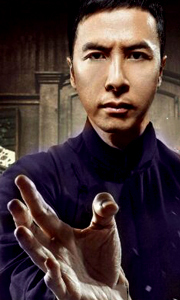 However, when corrupt coloni..
Kung Fu sensation, Donnie Yen, returns as martial arts legend, Ip Man, in the most anticipated martial arts movie event of the year. Having defeated the best fighters of the Imperial Japanese army in occupied Shanghai, Ip Man and his family settle in post-war Hong Kong. Struggling to make a living, Master Ip opens a kung fu school to bring his celebrated art of Wing Chun to the troubled youth of Hong Kong. His growing reputation soon br..
Own Ip Man 3 DVD from Deff, DVD, Blu-Ray & 4K Video Specialists - Free UK Delivery..
An untouchable classic, IP Man is a glorious and evocative biopic of the man who defied an empire, pioneered the world's most explosive fighting art, and went on to mentor Bruce Lee- the greatest martial arts icon of all time. Set in Foshan, China, during the Sino-Japanese War, Ip Man vividly brings to life the brutality of the infamous Japanese occupation, where once proud men are forced to fight to the death for a precious bag of rice..
An untouchable classic, Ip Man is a glorious and evocative biopic of the man who defied an empire, pioneered the world’s most explosive fighting art, and went on to mentor Bruce Lee - the greatest martial arts icon of all time. Set in Foshan, China, during the Sino-Japanese War, Ip Man vividly brings to life the brutality of the infamous Japanese occupation, where once proud men are forced to fight to the death for a precious bag of ric..